Spotify is here in Singapore! Before you read on, this is NOT an advertorial for the app! I just came across the app and thought it will be a great app to share with everyone! If you are a music lover, Spotify is an app you MUST have! So quickly read on before you decide whether you should jump into the bandwagon! Spotify a free music streaming service from Sweden, launched five years ago. It is an award-winning music service offering a legal and superior quality alternative to music piracy. Spotify provides instant access to whatever music you want, whenever and wherever you want it. This is through a simple, clean and quick-to-use platform via an ad-supported, free-to-the-user service and a paid subscription service (S$9.90 for non-ad version). Spotify was founded in 2006 by Martin Lorentzon and Daniel Ek. The company HQ is currently in London, UK, with further offices in Stockholm, Gothenburg and New York. Spotify lets users listen to their catalogue of more than 20 million songs for free on their desktop or laptop PCs. The free service will play between three and four advertisements every hour. A paid version of the service lets users take the music offline into their iPods, mobile phones and tablets with no advertisements. According to Head of New Markets for APAC, Spotify, Sriram Krishnan, paid and free users get access to the same catalogue of music. Through its relationship with 300,000 music labels, the service ingests about 20,000 songs per day, adding about 7 million songs per year, added Mr Krishnan. “Our biggest competition is piracy,” said Mr Krishnan. Mr Krishnan added: “At this point in time, we are the largest music streaming service, we’ve 24 million active users, 6 million paying users — that gives us a conversion of free-to-pay of more than 20 per cent, which is amazing. “More than 20 million songs, relationships with 300,000 labels, we’re contributing US$1 billion dollars (S$1.2 billion) to the music industry come end of the year. Now we’re a force to be reckoned with. And we won’t stop until piracy’s stamped out. “We take pride in knowing that as soon as we launch in the country, piracy has been reduced,” said Mr Krishnan. 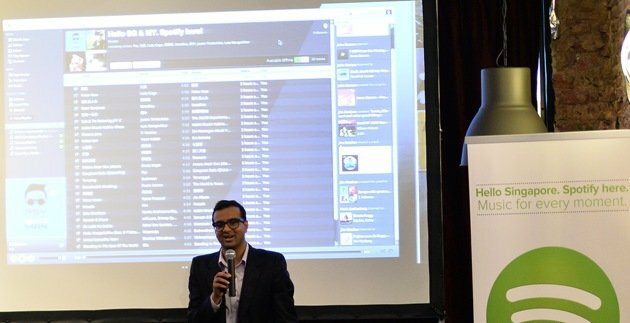 Spotify is officially launched in Singapore, Hong Kong and Malaysia on 16th April 2013, five years after it was first launched in the West. Sriram Krishnan, Spotify’s head of new markets, Asia Pacific, said: “We are now at 24 million active users and 6 million paying users so we’re confident the uptake in Singapore will be great and Hong Kong and Malaysia will be great as well. “From this part of the world, we’ll have local music, we’ll also ensure that the product is tweaked so that users can use the service and language that they are usually accustomed to,” he added. Spotify: The Music version of Youtube? You can get Spotify Premium on your phone for 30 days Free by clicking here! Check out Spotify website and their facebook page now! *Disclaimer: This is a personal review post and I’m not an ambassador of Spotify. » Social Media » Spotify is in Singapore!